Vegetables are well-known for being good for your health. Most vegetables are low in calories but high in vitamins, minerals and fiber. However, some vegetables stand out from the rest with additional proven health benefits, such as the ability to fight inflammation or reduce the risk of disease. This article takes a look at 14 of the healthiest vegetables and why you should include them in your diet. 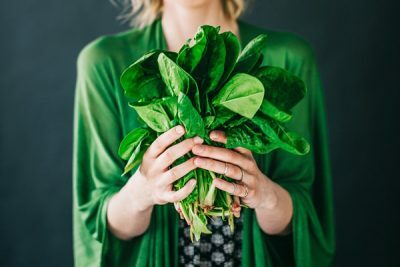 One cup (30 grams) of raw spinach provides 56% of your daily vitamin A needs plus your entire daily vitamin K requirement — all for just 7 calories (1). Spinach also boasts a great deal of antioxidants, which can help reduce the risk of chronic disease. One study found that dark green leafy vegetables like spinach are high in beta-carotene and lutein, two types of antioxidants that have been associated with a decreased risk of cancer (2). In addition, a 2015 study found that spinach consumption may be beneficial for heart health, as it may lower blood pressure (3). Summary: Spinach is rich in antioxidants that may reduce the risk of chronic disease, as it may reduce risk factors such as high blood pressure. Carrots are packed with vitamin A, providing 428% of the daily recommended value in just one cup (128 grams) (4). They contain beta-carotene, an antioxidant that gives carrots their vibrant orange color and could help in cancer prevention (5). In fact, one study revealed that for each serving of carrots per week, participants’ risk of prostate cancer decreased by 5% (6). Another study showed that eating carrots may reduce the risk of lung cancer in smokers as well. Compared to those who ate carrots at least once a week, smokers who did not eat carrots had a three times greater risk of developing lung cancer (7). Carrots are also high in vitamin C, vitamin K and potassium (4). Summary: Carrots are especially high in beta-carotene, which can turn into vitamin A in the body. Their high antioxidant content may help reduce the risk of lung and prostate cancer. Broccoli belongs to the cruciferous family of vegetables. It is rich in a sulfur-containing plant compound known as glucosinolate, as well as sulforaphane, a by-product of glucosinolate (8). Sulforaphane is significant in that it has been shown to have a protective effect against cancer. In one animal study, sulforaphane was able to reduce the size and number of breast cancer cells while also blocking tumor growth in mice (9). Eating broccoli may help prevent other types of chronic disease, too. A 2010 animal study found that consuming broccoli sprouts could protect the heart from disease-causing oxidative stress by lowering levels up to 116% (10). In addition to its ability to prevent disease, broccoli is also loaded with nutrients. A cup (91 grams) of raw broccoli provides 116% of your daily vitamin K needs, 135% of the daily vitamin C requirement and a good amount of folate, manganese and potassium (11). Summary: Broccoli is a cruciferous vegetable that contains sulforaphane, a compound that may prevent cancer growth. 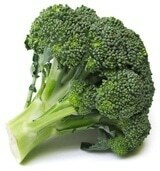 Eating broccoli may also help reduce the risk of chronic disease by protecting against oxidative stress. Garlic has a long history of use as a medicinal plant, with roots tracing all the way back to ancient China and Egypt (12). The main component of garlic is allicin, a plant compound that is largely responsible for garlic’s variety of health benefits (13). Several studies have shown that garlic can regulate blood sugar as well as promote heart health. In one animal study, diabetic rats were given either garlic oil or diallyl trisulfide, a component of garlic. Both garlic compounds caused a decrease in blood sugar and improved insulin sensitivity (14). Another study fed garlic to participants both with and without heart disease. Results showed that garlic was able to decrease total blood cholesterol, triglycerides and LDL cholesterol while increasing HDL cholesterol in both groups (15). Garlic may be useful in the prevention of cancer as well. One test-tube study demonstrated that allicin induced cell death in human liver cancer cells (16). However, further research is needed to better understand the potential anti-cancer effects of garlic. Summary: Studies show that garlic may help lower blood triglyceride levels. Some studies have also found that it could decrease blood sugar levels and may have an anti-cancer effect, although more research is needed. Like broccoli, Brussels sprouts are a member of the cruciferous family of vegetables and contain the same health-promoting plant compounds. Brussels sprouts also contain kaempferol, an antioxidant that may be particularly effective in preventing damage to cells (17). One animal study found that kaempferol protected against free radicals, which cause oxidative damage to cells and can contribute to chronic disease (18). Brussels sprout consumption can help enhance detoxification as well. One study showed that eating Brussels sprouts led to a 15–30% increase in some of the specific enzymes that control detoxification, which could decrease the risk of colorectal cancer (19). Additionally, Brussels sprouts are very nutrient-dense. Each serving provides a good amount of many vitamins and minerals, including vitamin K, vitamin A, vitamin C, folate, manganese and potassium (20). Summary: Brussels sprouts contain an antioxidant called kaempferol, which may protect against oxidative damage to cells and prevent chronic disease. 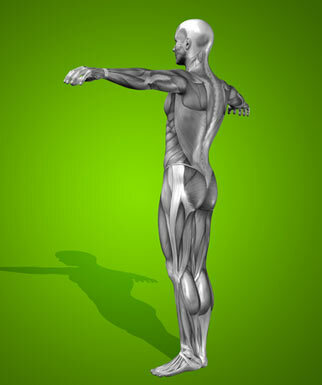 They may also help enhance detoxification in the body. Like other leafy greens, kale is well-known for its health-promoting qualities, including its nutrient density and antioxidant content. 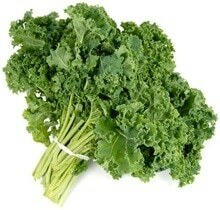 A cup (67 grams) of raw kale contains plenty of B vitamins, potassium, calcium and copper. 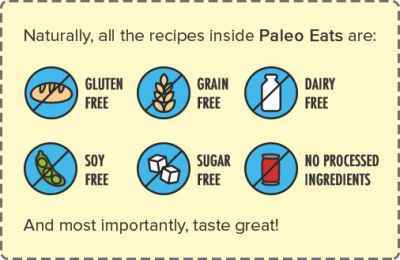 It also fulfills your entire daily requirement for vitamins A, C and K (21). Due to its high amount of antioxidants, kale may also be beneficial in promoting heart health. In a 2008 study, 32 men with high cholesterol drank 150 ml of kale juice daily for 12 weeks. 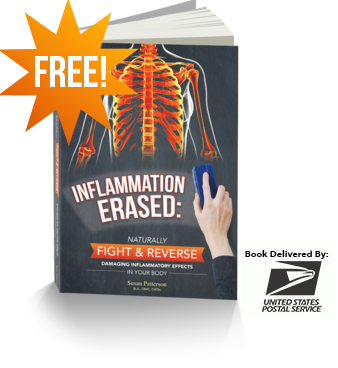 By the end of the study, HDL cholesterol increased by 27%, LDL cholesterol decreased by 10% and antioxidant activity was increased (22). Another study showed that drinking kale juice can decrease blood pressure and may be beneficial in reducing both blood cholesterol and blood sugar (23). Summary: Kale is high in vitamins A, C and K as well as antioxidants. Studies show that drinking kale juice could reduce blood pressure and LDL cholesterol while increasing HDL cholesterol. Peas are considered a starchy vegetable. This means they have a higher amount of carbs and calories than non-starchy vegetables and may impact blood sugar levels when eaten in large amounts. Nevertheless, green peas are incredibly nutritious. 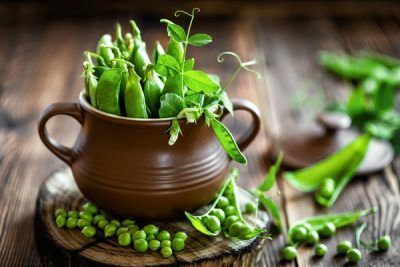 One cup (160 grams) of cooked green peas contains 9 grams of fiber, 9 grams of protein and vitamins A, C and K, riboflavin, thiamin, niacin and folate (24). Because they are high in fiber, peas support digestive health by enhancing the beneficial bacteria in your gut and promoting regular bowel movements (25). Moreover, peas are rich in saponins, a type of plant compound known for its anti-cancer effects (26). 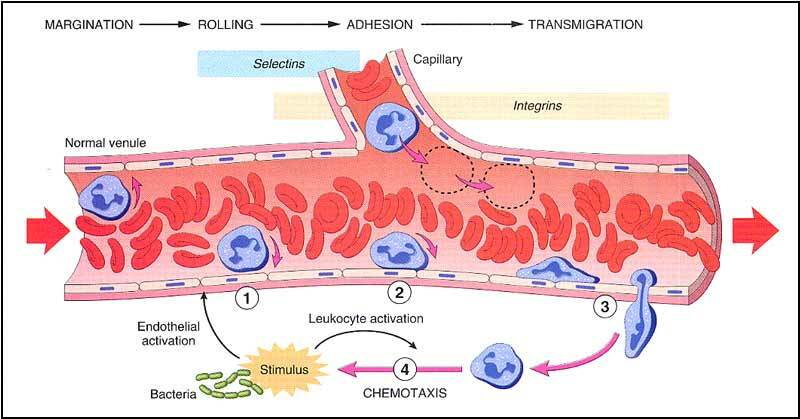 Research shows that saponins may help fight cancer by reducing tumor growth and inducing cell death in cancer cells (27). Summary: Green peas contain a good amount of fiber, which helps support digestive health. They also contain plant compounds called saponins, which may have anti-cancer effects. Swiss chard is low in calories but high in many essential vitamins and minerals. One cup (36 grams) contains just 7 calories yet 1 gram of fiber, 1 gram of protein and lots of vitamins A, C and K, manganese and magnesium (28). Swiss chard is especially known for its unique ability to prevent damage caused by diabetes mellitus. In one animal study, chard extract was found to reverse the effects of diabetes by decreasing blood sugar levels and preventing cell damage from disease-causing free radicals (29). Other animal studies have shown that the antioxidant content of chard extract can protect the liver and kidneys from the negative effects of diabetes (30, 31). Summary: Some animal studies show that Swiss chard could protect against the negative effects of diabetes and may decrease blood sugar levels. Ginger root is used as a main ingredient in everything from vegetable dishes to desserts. Historically, ginger has also been used as a natural remedy for motion sickness (32). Several studies have confirmed the beneficial effects of ginger on nausea. In a review comprised of 12 studies and nearly 1,300 pregnant women, ginger significantly reduced nausea compared to a placebo (33). Ginger also contains potent anti-inflammatory properties, which can be helpful in treating inflammation-related disorders like arthritis, lupus or gout (34). In one study, participants with osteoarthritis who were treated with a concentrated ginger extract experienced reduced knee pain and relief from other symptoms (35). Further research suggests that ginger could aid in the treatment of diabetes as well. A 2015 study looked at the effects of ginger supplements on diabetes. After 12 weeks, ginger was found to be effective in decreasing blood sugar levels (36). 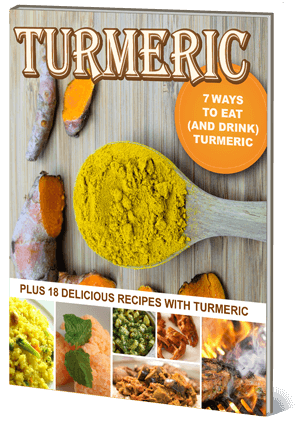 Summary: Studies show that ginger could reduce nausea and alleviate inflammation. Ginger supplements may also help decrease blood sugar. This spring vegetable is rich in several vitamins and minerals, making it an excellent addition to any diet. Just half a cup (90 grams) of asparagus provides one-third of your daily folate needs. This amount also provides plenty of selenium, vitamin K, thiamin and riboflavin (37). Getting enough folate from sources like asparagus can offer protection from disease and can prevent neural tube birth defects during pregnancy (38, 39). Some test-tube studies also show that asparagus may benefit the liver by supporting its metabolic function and protecting it against toxicity (40). Summary: Asparagus is especially high in folate, which may help prevent neural tube birth defects. Test-tube studies have also found that asparagus can support liver function and reduce the risk of toxicity. This vegetable belongs to the cruciferous family of vegetables and, much like its relatives, is brimming with antioxidants and health-promoting properties. One cup (89 grams) of raw red cabbage contains 2 grams of fiber as well as 85% of the daily vitamin C requirement (41). Red cabbage is also rich in anthocyanins, a type of plant compound that contributes to its distinct color as well as a whole host of health benefits. In a 2012 animal study, rats were fed a diet designed to increase cholesterol levels and increase plaque buildup in the arteries. The rats were then given red cabbage extract. The study found that red cabbage extract was able to prevent increases in blood cholesterol levels and protect against damage to the heart and liver (42). These results were supported by another animal study in 2014 that showed that red cabbage could reduce inflammation and prevent liver damage in rats fed a high-cholesterol diet (43). Summary: Red cabbage contains a good amount of fiber, vitamin C and anthocyanins. Certain studies show that red cabbage may decrease blood cholesterol levels, reduce inflammation and prevent heart and liver damage. Classified as a root vegetable, sweet potatoes stand out for their vibrant orange color, sweet taste and impressive health benefits. 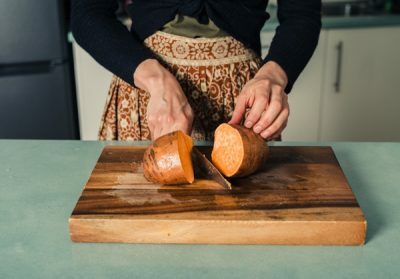 One medium sweet potato contains 4 grams of fiber, 2 grams of protein and a good amount of vitamin C, vitamin B6, potassium and manganese (44). It’s also high in a form of vitamin A called beta-carotene. In fact, one sweet potato fulfills 438% of your daily vitamin A needs (44). Beta-carotene consumption has been linked to a significant decrease in the risk of certain types of cancer, including lung and breast cancer (45, 46). Specific types of sweet potatoes may also contain additional benefits. For example, Caiapo is a type of white sweet potato that may have an anti-diabetic effect. In one study, people with diabetes were given 4 grams of Caiapo daily over 12 weeks, leading to a reduction in both blood sugar and blood cholesterol levels (47). Summary: Sweet potatoes are high in beta-carotene, which may decrease the risk of some types of cancer. White sweet potatoes could also help reduce blood cholesterol and blood sugar levels. Collard greens are a very nutrient-rich vegetable. One cup (190 grams) of cooked collard greens contains 5 grams of fiber, 4 grams of protein and 27% of your daily calcium needs (48). In fact, collard greens are one of the best plant sources of calcium available, along with other leafy greens, broccoli and soybeans. Adequate calcium intake from plant sources can promote bone health and has been shown to decrease the risk of osteoporosis (49). Collard greens are also high in antioxidants and could even reduce your risk of developing certain diseases. One study found that eating more than one serving of collard greens per week was associated with a 57% decreased risk of glaucoma, an eye condition that can lead to blindness (50). Another study showed that a high intake of vegetables in the Brassica family, which includes collard greens, may decrease the risk of prostate cancer (51). Summary: Collard greens are high in calcium, which could reduce the risk of osteoporosis. The regular intake of collard greens has also been associated with a reduced risk of glaucoma and prostate cancer. Also known as the turnip cabbage or German turnip, kohlrabi is a vegetable related to the cabbage that can be eaten raw or cooked. Raw kohlrabi is high in fiber, providing 5 grams in each cup (135 grams). It’s also full of vitamin C, providing 140% of the daily value per cup (52). Studies have shown that the antioxidant content of kohlrabi makes it a powerful tool against inflammation and diabetes (53). In one animal study, kohlrabi extract was able to decrease blood sugar levels by 64% within just seven days of treatment (54). Though there are different types of kohlrabi available, studies show that red kohlrabi has nearly twice the amount of phenolic antioxidants and displays stronger anti-diabetic and anti-inflammatory effects (53). Summary: Kohlrabi is rich in both fiber and vitamin C. Animal studies show that kohlrabi could potentially cause a reduction in blood sugar. From providing essential vitamins and minerals to fighting disease, it’s clear that including vegetables in your diet is crucial for good health. While the vegetables listed here have been extensively studied for their health benefits, there are plenty more vegetables that are also excellent for your health. Ensure that you’re getting a good mix of vegetables in your diet to take advantage of their many diverse health benefits and get the most nutritional bang for your buck.